Mr. Emerick Dee, from Traverse City Schools in Traverse City, Michigan, shared his expertise during a clinic with singers in the Hill Country Youth Chorus and music education majors on September 19. This entry was posted in alumni students faculty NEWS and tagged choral, music education, Traverse City on September 30, 2016 by Thomas S. Clark. Army Specialist Valerie (Cowan) Avila, M.M. 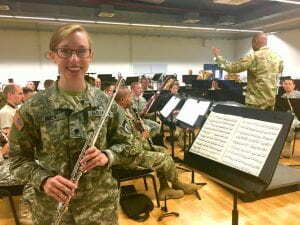 in Flute Performance, 2014, prepares to perform François Borne’s “Carmen Fantasie Brillante” for Flute and Wind Band with the United States Army Europe Band & Chorus, under the direction of Major Dwayne Milburn. She will premiere this work on October 3rd at Fruchhalle in Kaiserslautern, Germany and round out the Fall concert series on October 28th at Rokokotheater in Schwetzingen, Germany. Her husband, Specialist Andres Avila, B.M., 2014, Saxophone, is Principle Saxophone of the band. (Photo by First Sergeant Larry Dean, also a Texas State music alumnus). This entry was posted in alumni students faculty NEWS and tagged flute, Germany, Kaiserslautern, saxophone, United States Army Europe Band & Chorus on September 23, 2016 by Thomas S. Clark. On September 8th, the San Pedro Creek renovation project kicked off in San Antonio with the performance of a new opera entitled Las Fundaciones de Bejar. The City of San Antonio along with the San Antonio Symphony, Alamo City Opera, Opera San Antonio, Ballet San Antonio, and the Children’s Chorus of San Antonio commissioned John Phillip Santos, award winning author, to write the libretto and Joseph Julian Gonzalez composed the music. The performers include Texas State faculty Ronald Ulen and Kristin Roach, as well as alumni Thomas Soto and Diane Green Stanley. This entry was posted in alumni students faculty NEWS and tagged Alamo City Opera, Ballet San Antonio, Children's Chorus of San Antonio, City of San Antonio, Joseph Julian Gonzalez, Opera San Antonio, San Antonio Symphony on September 22, 2016 by Thomas S. Clark. Dr. Vanguel Tangarov performed as a concertmaster of the International Clarinet Association professors’ clarinet choir during the 2016 ICA Clarinet Fest in Laurence, Kansas, in August. He was invited to lead an ensemble comprised of 69 clarinet professors from universities and music educational institutions from all over the world. During the week, Dr. Tangarov performed a solo recital, premiering two solo clarinet pieces dedicated to him: Gestures for Solo Clarinet by Dimitar Ninov and Capriccio for Solo Clarinet by Zornitsa Petrova. Tangarov was also featured at the Vandoren Artists Recital and the Buffet Crampon Final Gala Extravaganza sharing the stage with World Class clarinet soloist from Juilliard School, National Symphony Orchestra, Boston Conservatory, Montreal Symphony, and Paris Opera. During the week of June 21-28, Tangarov and Dr. Adah Toland Jones, flute, presented master classes and performed recitals during the VII International Festival ‘Balabanov’s House Music Days” in Plovdiv, Bulgaria. Texas State students Vikas Chopra, Kristian Kostadinov and Luis Corpus – clarinet and Jessica Hall, Sarah Solomon, Stephanie Garcia and Ziqing Guan – flute, performed at the Musicartissimo Master Classes Final Recital. They studied with the Musicartissimo Master Classes faculty and the festival guest clinicians Philippe Cuper, Principal Clarinet of Paris Opera and Clarinet Professor at the Conservatory at La Bastille in Paris, France, and Lydia Oshavkova, Professor of Flute at the National Academy of Music “Prof. Pancho Vladigerov” Sofia, Bulgaria. During the end of May and the beguiling of June, Dr. Tangarov presented a clarinet master class at the Facultad de Musica de la Universidad Autonoma de Nuevo Leon, Monterrey Mexico. He was featured at three recitals in Monterrey and Mexico City, part of the Cervantino International and Parnassos International Music Festivals in Mexico, performing Mozart & Brahms Clarinet Quintets with the Sofia String Quartet. This entry was posted in alumni students faculty NEWS and tagged clarinet on September 14, 2016 by Thomas S. Clark. Dr. Martin McCain presented a 3-day masterclass in Brazil in addition to giving the South American premiere of James Kessler’s Concerto for Bass Trombone and Orchestra. He taught at the Austin Chamber Music Festival, Blue Lake Fine Arts Camp and gave a series of masterclasses in Singapore. McCain also performed in the Victoria Bach Festival Orchestra and presented two performance clinics on the classical and jazz all-state audition repertoire at the Texas Bandmasters Association Convention. This entry was posted in alumni students faculty NEWS and tagged all-state jazz, bass trombone, Brazil, fine arts camp on September 14, 2016 by Thomas S. Clark. Butch Miles was honored by the Zildjian Cymbal Company with a gold alloy mixture which comprises the making of the world famous Zildjian cymbals encased in a crystal award in recognition of being a Zildjian endorser for over 40 years. He was also honored by Conn-Selmer with a Lifetime Achievement Award for over 35 years as a Ludwig Drums endorser and educator. Butch was presented with a specially engraved LudwigBlack Beauty snare drum at the Conn-Selmer Institute summer convocation in Mishiwaka, IN. This entry was posted in alumni students faculty NEWS on September 14, 2016 by Thomas S. Clark. Dr. Dimitar Ninov saw his article “Functional Nature of the Cadential Six-Four” published in Musicological Annual LII/1, University of Ljubljana Press. Book 3 of the Made in SA piano series for children published by Kefáli Press also included two of his compositions. This entry was posted in alumni students faculty NEWS and tagged cadential on September 14, 2016 by Thomas S. Clark. “Utah Hamrick, director of jazz ensembles and instructor of jazz bass at Texas State University, spent a week in Chile this August working with students at the Projazz Institute in Santiago. The Projazz Institute had its beginnings in 1982 as the Academy of Music Projazz. The project grew in 1985 with the addition of renowned voice teacher Ana Maria Meza and saxophonist Patrick Ramirez. The program was renamed in 1999 as the Projazz International Music School creating the first jazz studies program in Chile and renamed again in 2007 becoming the Professional Projazz Institute offering the first professional level jazz studies approved by the Chile Ministry of Education. Projazz remains at the forefront in the training of professional artists. This entry was posted in alumni students faculty NEWS and tagged big band, Chile, jazz studies, ProJazz on September 13, 2016 by Thomas S. Clark. The Texas State Symphony Orchestra conducted by Carolyn Watson is a semifinalist in the 2016 Ernst Bacon Memorial Award in the Performance of American Music, College/University Division, for its role in the world premiere at Texas State of the commissioned opera Lady Bird: First Lady of the Land by Sheldon Harnick and Henry Mollicone. This entry was posted in alumni students faculty NEWS and tagged American music, Ernst Bacon, opera, orchestra on September 12, 2016 by Thomas S. Clark. Todd Oxford’s “Tango Magnetism” Album won two Global Music Awards Silver Medals for Best Instrumentalist and Best Album. Additionally, his live recording as a member of the Synaesthesia Saxophone Quartet of William Bolcom’s Badinerie from “Concerto for Saxophone Quartet and Wind Ensemble” won the Global Music Award Silver Medal for Best Instrumental. Global Music Awards is a top-tier music talent competition. Both albums are available from iTunes in both CD format and digital download. Oxford was hired for the third year as an adjudicator for both the ENKOR International Chamber Music Competition and Woodwinds/Brass Solo Competition. ENKOR is based in Düsseldorf, Germany. Mr. Oxford performed recent concerts with Duo 35 in Arlington, Austin, and the International Clarinet Society’s CLARINET FEST at the University of Kansas. He is a Semi-Finalist for the American Prize in the Instrumental Solo Category. Finalists will be announced shortly. The American Prize is a series of new, non-profit, national competitions designed to recognize and reward the very best in the performing arts in the United States. This entry was posted in alumni students faculty NEWS and tagged American Prize, chamber music, Enkor, Global music, saxophone on September 7, 2016 by Thomas S. Clark.